Office 2007 Open Business Licensing, Open Business + Software Assurance, and Open Value Licensing SKUs. We had two options: A spreadsheet of SKUs, or call in several times to Licensing to get a consensus of what could be the right SKUs. 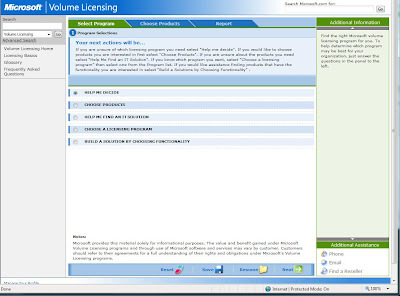 It seems that Microsoft has brought back the licensing configurator, but it is now called the Microsoft Product Licensing Advisor (MPLA). I have run through a number of different licensing schemes and it seems to be a lot more thorough, and a lot quicker than the old Configurator. There are a number of ways to go about finding the right licensing solution. For those who know what products and licensing scheme we want to use, it is quick and painless. And, it looks like we actually get the right SKUs! For those who are not too sure which licensing scheme is for them or their clients, there are a number of very well thought out survey type steps that will offer the best licensing scheme based on the answers received. One bonus feature is links to info and trial version downloads on the various products being offered in the licensing scheme. A really neat feature though, is the thorough explanation of what features are included with Software Assurance. This alone will go a long way to clearing up the air about what Software Assurance can do for a client! So far, it works way better than the old configurator. The new Advisor is a huge step forward! UPDATE 2007-05-24: Updated the URL for the advisor as the original link no longer works.